Perfect Cleansing Oil contains Mineral Oil: a clear, odorless ingredient which is widely used in cosmetic industry because of its safety quality and liquid form that will not clog pores. The Perfect Cleansing Oil will effectively remove waterproof makeup and dirt instantly, leaving your skin supple and dewy. It is especially helpful when used in dry weather or for those with dry and flaky skin problems. I have been using this oil for just over a week now, everynight. I normally take two pumps and massage it into my face and neck. It gently dissolves my makeup or any traces of dirt. There is a slight fragrance to it which I like, its rather soothing and makes the whole process seem more relaxing. I massage it in circular motion starting at the forehead and working my way downwards into my necks. Add a few drops of water which instantly turns it into a milky emulsion and I carry on massaging. I rinse it off with splashes of luke warm water, continuing to massage the skin as I splash. 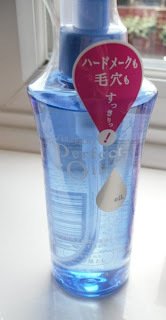 The oil leaves a really clean and smooth feeling to my skin, much comfier than the MAC oil I previously used, which I do like but it can often leave my skin feeling slightly tight/dry. After the MAC oil I would often have to reach for the toner straight away to re-balance my skin but with this oil there is no urge. The skin feels super comfy and smooth. Overall I really rate this product, Its one of the best oils I have tried. It comes in cheaper than a lot of oils on the market atm too. I paid about £8/9, thats delivery included. My skin is clearing up rather rapidly atm too, Im not sure if this has any affect on the curing but I would like to believe it plays a fundamental part along with the aspirin mask I have been using. I purchased this from AlphaBeauty on Ebay, I believe its also available on adamsbeauty too. OOOH! Thanks so much for reviewing this! I might just try this after I try Fancl's CO. Thanks for the review and happy easter Suzi. Happy Easter Suzi! I didn't have an egg to eat today, I was greedy and finished it the other day lol. Thanks for the review - this sounds good! ah so my skin is dry so now that i read your entry.. i should go for this product instead of MAC, right?